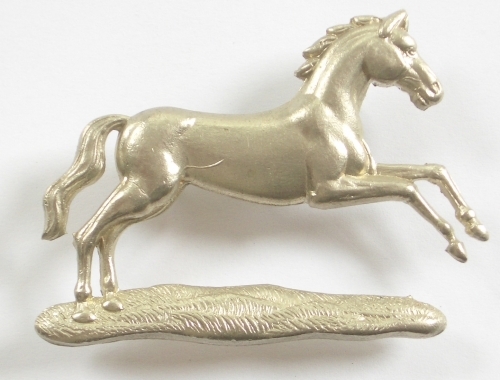 A good die-stamped white metal rearing horse on loops. Northamptonshire Yeomanry Cavalry was formed on 3rd May 1874, disbanded 1828, reformed 1830 and disbanded again in 1873, the Northamptonshire Imperial Yeomanry was raised by Earl Spencer on 7th February 1902 with its HQ at Northampton. On 1st April 1908 it transferred to the Territorial Force as Northamptonshire Yeomanry.